This post was originally published in The Commonwealth Heads of Government Meeting 2018 Report. A few short years ago, the idea of sustainability drew praise as something that ought to be encouraged for its environmental benefits, despite what was then seen as its inevitable trade-off with economic growth. That was Phase One. Phase Two emerged from a number of empirical studies that found that the trade-offs weren’t so great after all, and that sustainable development and economic growth could go hand in hand. More recent research and technological innovation, articulated in the New Climate Economy project and other smart initiatives, has brought us to Phase Three, which recognizes that sustained economic growth can only be achieved by investing in low-carbon and less-polluting models of development. This is especially important for the Commonwealth countries – the majority of which are at risk from phenomena exacerbated by a changing climate. Across the Commonwealth’s 53 member states, natural disasters affect 28 million people and cause economic losses of $8 billion each year. One key way to start addressing this challenge is by investing in sustainable infrastructure, which is fundamental to reigniting growth, delivering on the Sustainable Development Goals (SDGs) and reducing climate risk in line with the Paris Agreement. Between now and 2030, the world needs to invest $90 trillion in infrastructure. Developing countries – including many in the Commonwealth and especially those with fast-growing cities – will require 70 percent of that investment. The global south will account for roughly two-thirds of all infrastructure investment (about $4 trillion a year) over the next 15 years. This new infrastructure need not cost more than conventional infrastructure over its lifecycle, since the additional upfront costs can be offset by rapid gains in efficiency and fuel savings. In fact, addressing sustainability issues as set out in the SDGs offers a huge business opportunity in parts of the world where the need is greatest. The Business & Sustainable Development Commission showed how sustainable business models could unlock more than $12 trillion in new market value in food and agriculture, energy and materials, health and wellbeing and cities, creating up to 380 million jobs by 2030. As the Commission’s Better Business Better World report noted, what’s needed is an economic model, which is not only low-carbon and environmentally sustainable, but also turns poverty, inequality and lack of financial access into new market opportunities for smart, progressive, profit-oriented companies. Two examples are of particular relevance for Commonwealth countries: cities, and coastal development and the marine economy. First, cities. The projected growth of cities, especially in Africa, Asia and Latin America, offers some of the biggest opportunities for low-carbon development and increased prosperity. The integration of new mobility services into existing urban transportation systems is one such golden opportunity, with the prospect of more affordable, convenient and environmentally friendly transport for all. The case for better urban transport could not be clearer. Transport is now responsible for 23 percent of global energy-related carbon dioxide emissions. Congestion costs range from 1 percent of GDP in cities in the developed world, to over 5 percent in Beijing, Sao Paulo and Bangkok. The health costs associated with road crashes range from 1 to 5 percent of GDP in developing countries. 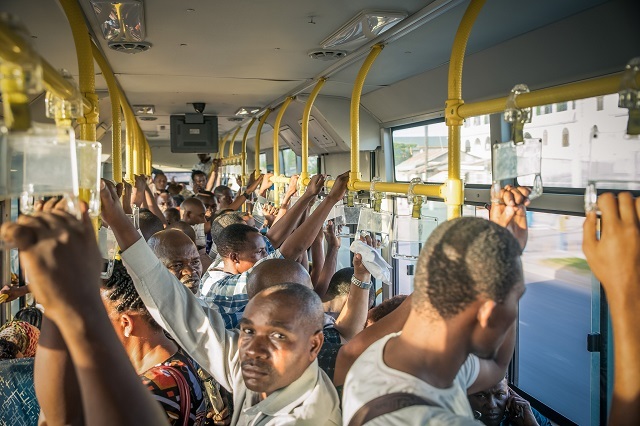 Transport costs disproportionately impact the urban poor, who spend 25 to 30 percent of household income on transport. All Commonwealth countries have great opportunities for sustainable urban development. Consider India and Tanzania, for example. In India, where the urban population is expected to nearly double to 800 million by 2050, the decisions taken by Indian policymakers over the next few years will determine its course for decades. Staying with the current sprawling, unconnected pattern of urbanization could cost an estimated $330 billion to $1.8 trillion by mid-century. In contrast, designing more coordinated, connected cities could bring lower costs for public infrastructure and transportation, while cutting down on traffic casualties, congestion, air pollution and health risks. Nationally, India is on track to exceed its goal of having 175 gigawatts of operational renewable energy capacity by March 2022, while it aims to sell only electric vehicles by 2030 and to stop approving new coal mines beyond those already in the pipeline. In Tanzania, where the urban population is projected to exceed 60 million by 2050 (four times the number in 2012), most of the growth is expected to take place in Dar es Salaam. Until now, urban development has evolved without clear spatial planning and essential infrastructure to meet basic human needs. At the same time, the country’s poor and marginalized city-dwellers are the most vulnerable to the impacts of climate change, as temperatures rise and unpredictable rainfall and intense droughts lead to food shortages, water scarcity, floods and power outages. Tanzania’s National Urban Development Strategy can help deliver the sustainable growth that its cities need, coordinating policies across government sectors and aligning with the activities of sub-national governments, the private sector and civil society. Second, coastal development and the marine economy. A majority of Commonwealth countries are small island states or countries with significant coastlines, and thus are especially vulnerable to rising seas, coastal storms and erosion, mangrove and coral reef loss, and associated food and energy insecurity. They face economic threats from loss of fishing and tourism revenues, from flooding and loss of infrastructure. Commonwealth countries are at the forefront of efforts to find investment and policy options that will solve environmental problems, while promoting jobs and growth. This isn’t easy for individual countries and a Commonwealth-wide coalition of leaders could make a major difference. It’s deeply encouraging to see leadership embedded in the Commonwealth strategy, which aims to fundamentally change how the world’s oceans, seas and coastal areas are managed. This can protect its members while fostering sustainable economic growth based on new sectors such as aquaculture, biotechnology, ocean-based renewable energy and tourism – all of which will require innovative approaches to infrastructure. The astonishing innovations in green growth technology and policy that have characterized recent years have been driven by necessity. Just as Commonwealth countries are deeply vulnerable to climate change, so they are the natural innovators and testing grounds for new paths forward.